Carol and Ken Jones had been studying spiritual principles of living for decades. So when cancer was found throughout Ken s body, it put them to the test, challenging them to live what they had been learning. What they discovered and share with you is mind-boggling and heart-opening. Ken said this as his body progressed through its illness: December 2009: I do not know what Spirit has in store for me. I will keep breathing as long as Spirit gives me breath. And if melanoma absolutely must claim my body, it can have it. Melanoma cannot go where I go, because I go into the pure Spirit of the Soul Realm that is my true home. 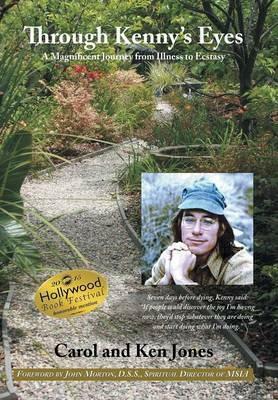 "Through Kenny s Eyes" is an unusual and unusually positive glimpse into living fully and dying well. Ken and Carol Jones have written an extraordinary book about the liberation of experiencing death, dying, and grief from a spiritual perspective. Drs. Ron and Mary Hulnick, co-directors of the University of Santa Monica and authors of "Loyalty to Your Soul: The Heart of Spiritual Psychology" If you have any considerations or fears about dying, read this book and share it with others. It will shed light on your awareness about the mystery of death and help you relax about it. This book is a gift that must be opened. Agapi Stassinopoulos, author of "Unbinding the Heart" An Amazing gift for anyone to gain comfort and inspiration, guidance and courage. All of us will pass, and to know what the passages are in such humanity and ordinariness is the treasure of this account. Recommended reading for any course on death and dying. Leigh Taylor Young, Emmy award-winning actress, lover of Spirit, life, and serving the good Carol and Ken s unflinching look at the often sanitized subject of death is refreshing, and interested readers will gain a deeper understanding of what Carol calls the real treasure of consciously leaving this world. Kirkus Indie, Kirkus Media LLC"